Have you ever broke your iPhone or worse, lost it? 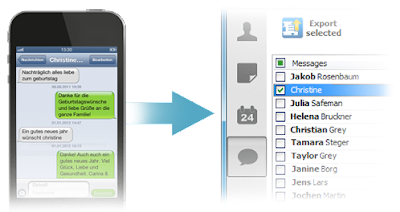 Have you ever accidentally formatted all of the data; or even by mistake clicked the delete button on an important SMS? Well, all that anger and rage of losing your important text messages can become a thing of the past. The iPhone is a Smartphone with many features, one of them being able to back up your SMS and other data to your personal computer for safe keeping. There are many ways you could do that. All you have to do is follow the step by step instructions and you’ll have your SMS on your PC in no time! We have listed three different ways to backup your iphone messages. The first third party application I would like to introduce is Wondershare MobileTrans. It is a desktop program that mainly focuses transferring files between different phones. But it can also backup all your iPhone data to computer and mac with simply one step. Besides these functions, it also supports restoring backups. This is one of the preferred way to backup your messages. The simple option is backing it up with itunes. This will effectively backup your iPhone SMS (and other media if you choose) to your PC. However, this method will not allow you to view your SMS or transfer them to another cell phone operating system such as Android. In order to do that, you will have to follow the next step. First off, you will have to open a specific file that contains your backed up SMS data. The file’s name is 3d0d7e5fb2ce288813306e4d4636395e047a3d2. Depending on your operating system, this file can be found in various locations. Once you open the Backup folder, you will find many other crazy named folders with various numbers, open the most recent one and you will find the 3d0d7e5fb2ce288813306e4d4636395e047a3d28 file. This file can be opened by many different programs and websites such as iPhone SMS that allows this file to be converted into a Microsoft Office Excel, HTML or PDF so that you can view them with ease. Sit back and relax for a bit. The app will automatically start to back up all of your SMS and MMS data along with any link, photos, videos, and emoji that was sent via SMS or MMS. Select which format you wish to export these messages too. Like the above method, this method too has the ability to back up SMS messages to Microsoft Office MS Excel, but also offers you the additional ability to export them to Microsoft Office MS Word, CSV, plain text, or even a special, interactive Web Page format. That is it! Simply open up your newly created file which contains all the data and you can view your SMS. The Web Page format in particular is quite special. Double clicking it will open up your browser and show you your SMS and MMS just as your iPhone would, allowing you to interact with them as if you were viewing them on your phone; complete with all the music, videos and audio files, pictures and emoji built in. Disk Aid has been yet another app that adds a bit more in terms of backing up. Not only can you back up your SMS and MMS, but DiskAid also allows you to back up your iPhone’s iMessage as well as other notes, contacts, and photographs, videos, pictures, voicemail, call history, and memos. It also serves as a file transfer program too. The application has support for the latest operating system OS as well, the iOS7, in case you have upgraded your iPhone. The process for DiskAid is rather simple. While there are many other 3rd party applications that can perform these actions, there aren’t many that can get the job done with the interactive formats of CopyTrans or the added extra backing up abilities of DiskAid. These two are irrefutably the best 3rd party application for backing up SMS to your PC. Again, if you prefer not to install any unnecessary applications, you can simply stick to the slightly longer iTunes method. All 3 methods should safely get the job done. Congratulations, you now have your SMS as well as other data backed up to your PC, job well done! Thanks a lot for sharing the article on this topic. That's an awesome article. I enjoyed the article a lot while reading. Thanks for sharing such a wonderful article. I want to say very thank you for this great information's. Now I understand about it. Thank you!Iphone, Samsung. Now a days raising on iPhone phone using for website, students, online shop owners and etc. It's very help to all kinds of information very clearly deliver on that display. So The usage of day by day raising on the world.Keep it up man!!! It is really great option for us to keep online yourself. Now a days everyone has desire to keep a iphone. Useful information. To be honest, I didn't think of backing up my SMS texts until now. Hey This is Amazing Post.... Useful information you are sharing.